To be fair to Peter he says every year that his skis of the year ARE his subjective picks. If you want to buy the highest rated skis it is easy to do. With his site you actually get two things, rankings or scores (which by the way are totally subjective as well) and Peter's picks. I also think as I said last year that the fact that Kastle is an expensive ski not in wide dsitribution had to account for some of the reason that he chose the Sultan 85 over the FX 84. I have yet to ski the Sultan, but IMO the FX 84 did not deserve anywhere near all 5's. It's a nice ski, quite versatile but by design it does not hook up well or quickly when put on edge on harder snow. It is a very forgiving ski and a super ski for what is designed, which is to be used mainly off piste in the back country. My sense is that both the MX 78 and the MX 88 blow it away but I have yet to ski either. Maybe we can take both out one day at Squaw this year Phil (assuming Start Haus carries both)!! I am still working on getting the Kastle rep to come to Montana so that I can demo them. Numbers aren't facts. Numbers are what statisticians use to make conclusions sound like they are based on facts. Seriously, though, the numbers represent an aspect of a skis performance. How much does a Clean Carve value of 5 contribute to a Powder or Freeride ski? What about a Rebound value of 5, or a lightness value of 5. For a crud ski, you may not want a light feel. Phil you do reaize that the numbers are what testers are writing down? The numbers are totally subsjective as well. As well he puts up the big disclaimer that the skis of the year are subjective and NOT the highest scoring ski. I think we all could think of things that we might do better or different if we were running Peter's site. Having said that another superior alternative does not exist. Yes demoing skis is the best but where else can you get a reasonably consistent viewpoint on a large number of skis. And whether you like his criteria and or his approcah in reviewing skis, he has been quite consitent with what he finds and highlights as great skis (admitting his weakness in big mountain powder skis). Hey for $20 a year I still find it to be of way more value than any reviews I read elsewhere. The ski mags are a complete joke!! The ski mags are a complete joke!! And yes, for $20 Realskiers reviiews are a wonderful resource, especially if you are looking for older models. I am interested in a narrower waisted ski to replace my Every Thangs (shudder, what a horrible name). Good skis, but too much cross over with my Maunga's (aka early Fischer Zeal version). would like a good carving ski. I want to continue working on my carving skills. I believe those are the base from which other skills blossom, even bumps. And JBotti, I too still have my iC160's. Skied them one day this year when I lent my sister my ET's. Still a good ski. Don't like the chatter they develop at higher speeds though. I think we all could think of things that we might do better or different if we were running Peter's site. Having said that another superior alternative does not exist. Yes demoing skis is the best but where else can you get a reasonably consistent viewpoint on a large number of skis. And whether you like his criteria and or his approcah in reviewing skis, he has been quite consitent with what he finds and highlights as great skis (admitting his weakness in big mountain powder skis). Hey for $20 a year I still find it to be of way more value than any reviews? I read elsewhere. The ski mags are a complete joke!! I find it funny that one persons subjectivity outweighs a group of tester...seriously quality testers. I personally have a problem with number testing anyway. Again, I won't get into what a review SHOULD be..until I can produce it. Mike:? Chill a bit.? Can you judge a book by reading the last pages?? Yes, your honor, I plead guilty to coming to a conclusion without all the facts. One of these days, I'll learn to keep my big mouth, and cynical writing style, shut in areas of ski reviews. Interesting thread about ski reviews and Peter's in particular. As he and I are both carvers, we like the same style skis. To revisit his "Skis of the Year", I did not know his selections were more of a personal preference. My thoughts are that he is staking his own thinking and needs, apart from what the review process turns out. And that's o.k. as long as the distinction is clear. As individuals, we like what we like. In further thinking about a review of all past "skis of the year", it's logical that as he likes carvers, the history will indicate this bias. If I skied more, I'd own a mid-70's carver for those majority of days when mountain conditions just don't warrant a specific snow condition like ice or pow. 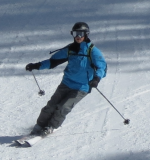 They are very comfortable to ski all day and just plain fun fast or slower. Great to ski on days skiing with friends when cruising seems to rule. Yet, if I published a ski review publication, I'm not sure I would use "Ski of the Year" as a projection or promotional term. I'd rather save that term for a look backward. Minor point, without blind testing, i.e., topsheets covered, any review will be skewed by personal baggage. Anyway, here's to Peter and his reviews. An annual precursor of ski season and gets the juices flowing as the weather begins to cool. And here's to Jim and his purchase of this year's Ski of the Year. Many pow days to ya. Maybe we can do at least one together. And yes, for $20? Realskiers reviiews are a? wonderful resource, especially if you are looking for older models. Consider talking to Phil about finding a pair of Kastle RX70's sometime during the season. Ron and I both have demo's from Kastle that Phil got for us and this is one used ski that just rocks. I loved the RX on the day I demo'd it and it's going to be the Supershape replacement at some undetermined future point. Phil and I have had a least one discussion and just in case he forgot, Phil think of me when you get a RX in 170. I followed Phil down a bump run on our demo day. He was on the RX 70 and just turning them so quick. Elk Mountain ski for sure! Yeah at the end of the day that is what all of us are doing here, trying to get oursleves jacked up for ski season and we're all hoping that the time will pas quickly til there is snow on the ground!!! I do have a ski purchase to announce: I just bought a pair of the Head i Speeeds in a 180 length. I skied these once before in a 175. I absolutley loved them. I need a pair of skis to race GS with this year. Last year I was skiing my Fischer Progressors and some Dynastar Race stock 21m TR GS skis. The Dynastars were too much ski and too wde a TR. My brother essentially stole my progressors he liked them so much. I was going to buy the Fischer RC's which were on sale at Ski Depot for $649 with bindings. Then I noticed that Ski Depot offers discounts to USSA members and since I have been one for the last 2 years I called and got the pricing sheet. They had the I Speeds for $799 with bindings. Not a steal but only $150 more than the RC's. I had $2450 in my paypal account all from seling skis last year (and this is my ski slush fund for this year). I decided to pull the trigger and I am pretty stoked. 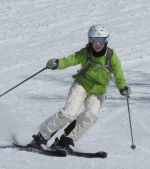 These skis also have KERS, which is an amazing technological advance in skis primarily used on hard snow!!. I have room for one more purchase this year if I feel the urge. That may be the Chariots after I demo them. If not I may carry a credit into next year, which would be a first.